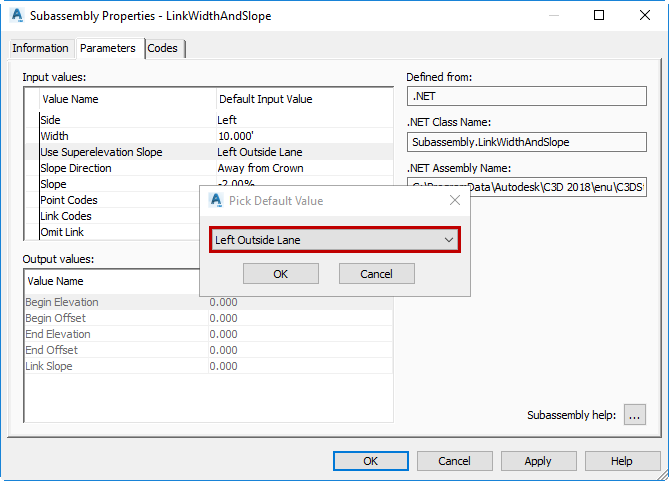 The Civil 3D command Mirror Subassembly is a handy tool and can be used to copy subassemblies from one side of an assembly to another. When a subassembly is mirrored the new subassembly will have the same parameters as the original, but the side value parameter will be the opposite. Right becomes left or left becomes right. Here I’ve quickly set up a left side of an assembly with links representing a lane and a curb. My alignment has superelevation, so I’ll set the link representing the lane to follow the superelevation slope. It’s on the left side so I’ll set the parameter to “Left Outside Lane”. I’m satisfied with all my parameters so I’ll mirror the subassemblies to quickly finish my assembly. Looks good, so now I’ll build my corridor, right? Not so fast… Let’s take a closer look at the right side. Specifically, the link representing the right lane. The “Side” parameter shows the subassembly has been mirrored, but the rest of the parameters are exactly the same as the left side subassembly, including the “Use Superelevation Slope” value which is set to a left side value even though the subassembly was mirrored to the right side. We certainly don’t want that. 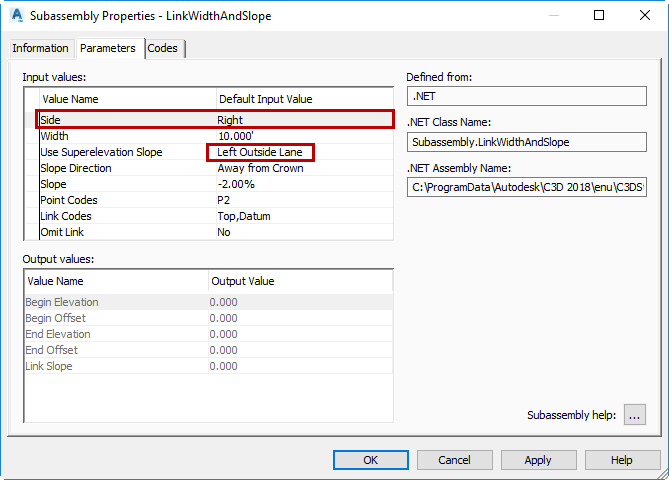 It might have been easy to assume that all subassembly parameter values are being mirrored right to left or left to right, but this is not always the case. Double-check your values before building the corridor. The mirrored subassembly will have the same values as the original. Be careful, this may not produce the desired outcome.